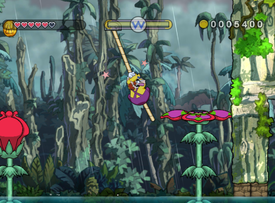 Soggybog River is the fourth level in the Jiggle Jungle in the game Wario Land: Shake It! There is also a secret map located here, which leads to Riverbloat Rapids. It is located near the rope vines and Scarracudas. Soggybog River is a swamp-like area filled with brown and murky water. Ropes from Ropey Jungle also make another reappearance here. Logs provide as platforms to allow Wario to cross the water. Many Turkeyjerks and Venus Guytraps of both varieties are located here. When Wario finds the caged Merfle, he needs to use the Max Fastosity Dasherator below to run across the water and back to the start. Jabu jabu no mori Splashing Forest; jabujabu is a Japanese onomatopoeia for splashing water. This page was last edited on January 16, 2019, at 11:26.